Though I pride myself by reviewing and watching highbrow movies like small indies and foreign films, I’m not invulnerable to B movies. I am a big fan of Mystery Science Theater 3000, plus I spent many of the early years of my childhood watching Godzilla and other sci fi films. So I’m trying to justify why I watched Killer Klowns From Outer Space. I’m not going to lie, Killer Klowns is not a good movie. It’s actually really terrible, riddled with more plot holes, clichés, and stereotypical characters than a bad carny tent. But Killer Klowns accepts that it’s an awful movie, which is what I enjoyed about it. I mean it’s impossible to make a good film with the title “Killer Klowns From Outer Space” (with the “k” instead of a “c” for clowns), even if a director like Orson Welles or Stanley Kubrick got their hands on it. Killer Klowns knows its audience and doesn’t condescend its material like the Transformers movies do. So while Killer Klowns is a bad movie, it’s pretty enjoyable to watch. In a small Californian town, a comet lands, which is inhabited by aliens who look, act, and pretty much are clowns. They’ve come from space in their circus tent space ship to turn people into cotton candy balls so they can eat them. Two teens, Mike (Grant Cramer) and Debbie (Suzanne Snyder) try to warn the police, but they don’t believe them. Pretty soon the clowns wreak havoc among the town with their, errr, clownish tendencies. 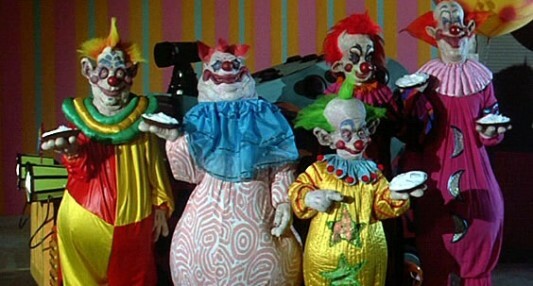 Killer Klowns is a pretty campy movie, with a blaring 80s soundtrack. The humor in the film is really based that the aliens are clowns, and there are some scenes I found pretty funny, including one where a clown literally “knocks the block” off of a biker. On the other hand, some sequences are just downright disturbing, especially one in particular I’m not sure was done intentionally. I’m not going to describe it, but just look at the picture below to get what I’m saying (but don’t say I didn’t warn you). I’ll have to admit the special effects are actually pretty decent. The clown faces look good, even though the film contains some dated CGI (or at least I think it’s CGI). Of course, this doesn’t redeem the film from its many flaws, which I said earlier. But regardless, I enjoyed Killer Klowns. Maybe it is pretty bad but it sure is a lot of fun. Clowns scare the crap out of me so I think I’ll skip this one. I’m a big fan of B-movies in general though. These are some pretty creepy clowns but the movie’s fun to watch. It’s available on Netflix Instant. Thanks for commenting. Yes! I love KK’s and every terrible feature it possesses! It’s bad in so many ways but as you mention, the filmmaker’s are aware of that. I love how they play on some people’s clown phobia. Their big top, their goofy arsenal of clown weapons, their weak spot, its all so absurd. But then again, they’re trying to be! Good review! This brought back my clown phobia. It’s dumb but it’s a lot of fun, and I really enjoyed the absurdness. Thanks! Really fun flick. But Mike is one of the most annoying protagonists ever. Oh yeah, Mike was pretty annoying. They should have cut down his screen time. I loved watching this movie when i was younger and I remember the clowns creeping me out every time. Good Review. The clowns really creeped me out too. Thanks! This is a classic late-night film on a weekend you stayed in. Believe it or not, those are the same circumstances I saw the film in. Thanks for commenting. My mom is in her sixties and still finds clowns creepy! I haven’t seen the film myself, but I appeciate you reviewing a film you enjoy but know is, objectively speaking, terrible. I have one of those movies from my teens: I’ve seen Big Trouble In Little China a countless number of times and it certainly qualifies as extra-cheesy if not terrible. (I have NO idea how it has such a high rating on Rotten Tomatoes.) Though not a b-movie, it isn’t one I readily admit to anyone I’ll always start watching if it’s on tv during a lazy Saturday afternoon. Have you watched the Big Lebowski yet?!?! Starring Jeff Bridges, John Goodman and Steve Buscemi…need I say more lol? My personal favorite comedy. Oh yeah, this falls in a guilty pleasures category. It’s an awful movie but it’s fun to watch. I can’t believe I haven’t seen TBL yet. I’m going to try to see it this or next weekend. Thanks for commenting. This one that is so bad it’s good! Yeah, this belongs in that category along with Troll 2 and Birdemic. Thanks for commenting. Troll 2 is pretty awesome. I love Killer Klowns From Outer Space. Not sure if you know this but they’re making a sequel to movie in 3D. I read about it the other day. The main guy from the first one will be in the sequel. I can’t wait to see if it is as good as the first one.